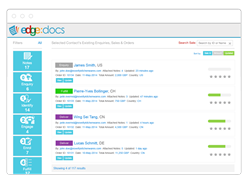 Morgan Goodwin has developed EdgeDocs, the only real world ready-to-go, online, software-as-a-service (SaaS) solution, which systematises the sale and export process, and removes the risk and mystery from the compliance and documentary burden. Meaning that for the first time exporting has been made simple for UK businesses. Today, thanks to EdgeDocs, many more UK business can give exporting a go and tap into the opportunities that exist in new markets across the globe...which will be music to David Cameron’s ears. Morgan Goodwin Limited has responded to the challenge thrown down by the Prime Minister to increase by 100,000 the number of small and medium-sized companies that export by 2020. It has developed EdgeDocs, the only real world ready-to-go, online, software-as-a-service (SaaS) solution, which systematises the sale and export process, and removes the risk and mystery from the compliance and documentary burden. Meaning that for the first time exporting has been made simple for UK businesses. And it will launch it at London’s Going Global Live 15 May 2014. The fundamental aim of David Cameron’s challenge is to persuade more companies to become exporters, and existing exporters to export more. Until now, ironically because of Government rules and regulations, which were easier-said than done. Morgan Goodwin has now cut through the bewildering myriad of red tape, compliance hurdles and forms to help UK companies get exporting…and get the country moving again. Geoff Runcie is Managing Director. Formerly Chief Executive of Glasgow and Aberdeen Chambers of Commerce and interim International Trade Director for British Chambers of Commerce, he has led Trade Missions and understands the export process and documentation regime well. He said: “We spent years helping small to medium size businesses who were trying to fulfil their exporting potential…but they were consistently failing." “Fears of identifying and complying with complex export regulations prevented these under-performing businesses from exporting, and as such failed to grow their business internationally." “In looking for a simple, quick and practical solution that encouraged businesses to export and, in doing so, made the exporting process easier, we were astonished to find there wasn’t one." Chairman and co-founder is Mark Sheahan. Entrepreneur, inventor, international British trade missionary and business advisor, Mark is driven to help businesses develop from small fledging start-ups to global enterprises. “We have de-mystified the export process,” he said. “We immediately recognised that exporting is much like any other type of sale with some extra elements. So we built a simple sales process tool with six easy steps, tested it with a large number of SMEs and they were very pleased with the result." “We then refined it to create a business process management tool that will appeal to every SME business because it gives them efficiencies in their national and international business needs. Our system talks to all the other specialist CRM and Accounts packages too." We are launching Morgan Goodwin and its key brands EDGE export solutions and EdgeDocs at Going Global Live at London’s Excel on May 15-16. Senior company representatives Abdul Mann (CEO) and Mark Sheahan (Chairman) will be available for interview/comment at Stand 3547. Alternatively, call them on 0131 248 3031 (calls will be directed to them). For more information, go to http://www.edgedocs.com.